The W10197U2 is Cartier's Must 21 series model. 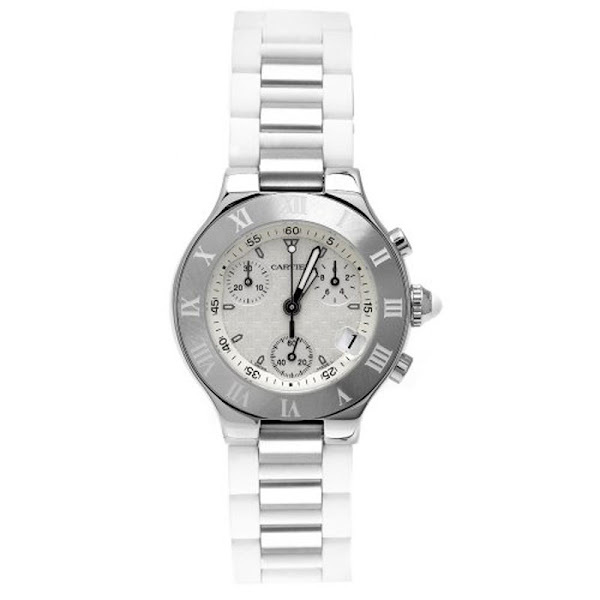 This watch is a luxurious, crisp timepiece with the athletic looks of a white rubber wristband, threaded with stainless steel accent pieces. This Swiss made Cartier watch features a scratch-resistant, sapphire crystal dial window protects a white dial with intriguing textures. Its handsomely crafted 31-millimeter case and bezel are featured in a high quality stainless steel. Furthermore, the W10197U2 model wristwatch's dial has three subdials and a date window at the four o'clock offer additional conveniences. Luminescent hands and a white rubber-tipped crown round out the clean-looking beauty of this Cartier timepiece. This wristwatch has a stainless steel case is topped by a stainless steel bezel that features engraved Roman numeral hour indicators and a white outer ring displaying black stick and Arabic numeral minute markers. This watch is powered by swiss-quartz movement as well as water resistant level up to 330 feet. In case you'd like to order yours, just saying, this Cartier Must 21's original price is $3,925. You can find an original Cartier W10197U2 Watch at the site(s) listed above. However, we don’t guarantee its availability as being listed here simply means that those site(s) has the item in question by the time we wrote the review. The review in this page is written by garnish at Monday, September 19, 2011. The post is tagged as analog, cartier, rubber, watch, women.